We have studied the effects of stevioside on the glucose and insulin metabolism in 2 models of diabetes in rats, STZ-induced diabetic rats and NIDDM diabetic rats induced by feeding with fructose. Stevioside (0.5 mg/kg), lowered the blood glucose levels in STZ-induced diabetic rats, peaking at 90 min. Stevioside administered twice daily also demonstrated dose-dependent effects in lowering the glucose levels in both diabetic rat models. 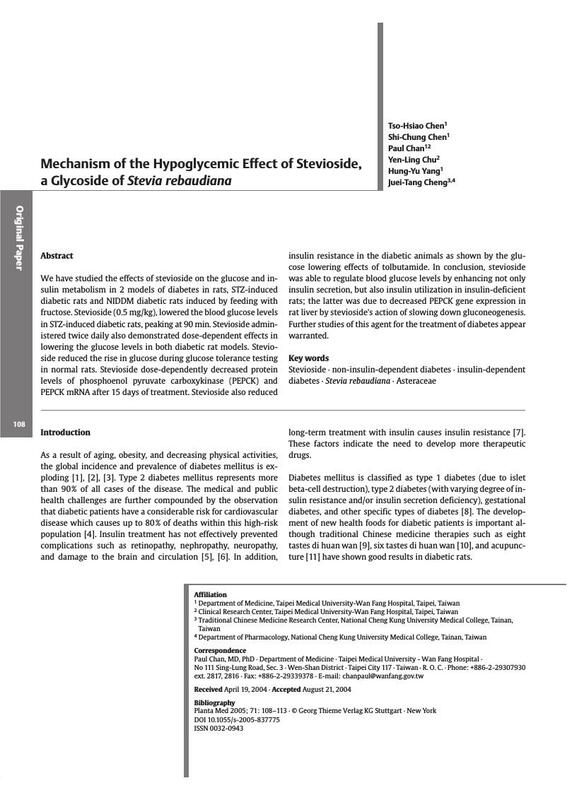 Stevioside reduced the rise in glucose during glucose tolerance testing in normal rats. Stevioside dose-dependently decreased protein levels of phosphoenol pyruvate carboxykinase (PEPCK) and PEPCK mRNA after 15 days of treatment. Stevioside also reduced insulin resistance in the diabetic animals as shown by the glucose lowering effects of tolbutamide. In conclusion, stevioside was able to regulate blood glucose levels by enhancing not only insulin secretion, but also insulin utilization in insulin-deficient rats; the latter was due to decreased PEPCK gene expression in rat liver by stevioside’s action of slowing down gluconeogenesis. Further studies of this agent for the treatment of diabetes appear warranted.